Can I trade stocks in pre-market and aftermarket? First of all, we wanted to let you know that the fees we charge are for real trades. We do not have a minimum transaction size. You can trade any number of instruments starting from one traded unit. The size of the minimum traded unit varies by instrument. You can see the specific value on EXANTE’s trading platform in the instruments field. We have a fee for withdrawing funds – it’s 30 EUR/USD/GBP. When trading Stocks & ETFs, the maximum rate on the main US exchanges is $0.02 per share. With European exchanges, fees vary from 0.01% to 0.18%. Trading on major European exchanges, such as Euronext Brussels or Euronext Paris, is subject to a 0.05% fee. EXANTE grants access to major Asian exchanges as well, with fees ranging from 0.1% on the Tokyo exchange to 0.25% on the Hong Kong Exchanges. Trading futures or options on the main US exchanges will cost you up to $1.5 USD. The exception here is futures trading on ICE Intercontinental Exchange where the maximum fee is $2.5 USD. Options trading on ICE will entail a charge up to $1.5 USD. Futures trading on the main European Exchanges has a fee of 1.5 EUR. The fee for trading on DGCX is 2 USD, on HKEX – 12 HKD, 20 JPY on OSE, 1.5 AUD on ASX and 2.5 USD on SGX. EXANTE allows you to trade both private and corporate bonds with fees starting at 9 bps for a range of bonds (i.e. both European and US Corporate and Government bonds). If you want to trade currency pairs, live market spreads start at 0.2 pips. There are also overnight fees applicable to short positions and FX. They depend on the market and are constantly changing. Current overnight fees can be found in the Client's area. EXANTE’s clients will now be able to trade 15 crypto assets. Leverages vary depending on the currency. For BTC, the leverage is 33%, for BCH, DASH, ETH, LTC, XMR, XRP and ZEC – 50%. The leverage goes up to 100% for BAT, ETC, IOTA, NEO, OMG and XAI. The price steps and price step values are $0.01 for BCH, BTC, DASH, ETH, LTC, NEO, XMR and XAI fund. For BAT, EOS, IOTA and XPR these are $0.0001, for ETC and OMG – $0.001. Shorting is only allowed for BTC, DASH, ETH, XMR, XPR and ZEC. There is a one-time subscription fee of 0.5%, a one-time redemption fee of 0.5% and a safekeeping fee of 3.5% p.a. charged on a daily basis. 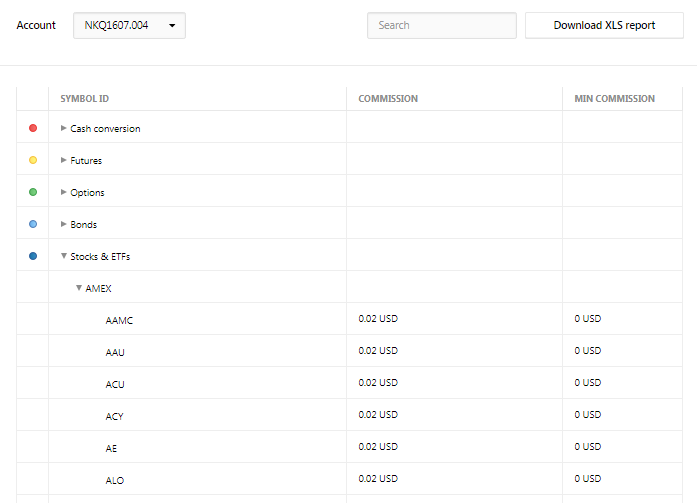 A monthly inactivity fee applies to accounts that did not perform any trading activity within the latest 181 days, do not have any open positions at all and have a balance less than €5000The empty accounts with the balance less than €100 may be closed after two years of inactivity. Recently, we introduced our EXANTE MasterCard. There is no issue fee and the card can be issued in GBP, EUR, and USD. There is a minimum deposit of 10,000 GBP/EUR/USD to get the card. There is no minimum transaction size with a maximum transaction size of 20,000 GBP/EUR/USD per day. The minimum withdrawal size is 50 GBP/EUR/USD and the maximum withdrawal size is 2,000 GBP/2,500 EUR/2,500 USD per day. There are no maintenance or transaction fees, but there is a 1% withdrawal fee with a minimum of 3 GBP/EUR/USD. A monthly inactivity fee applies to accounts that did not perform any trading activity within the latest 181 days, do not have any open positions at all and have balance less than €5000. The empty accounts with the balance less than €100 may be closed after two years of inactivity. The fees depend on the market you trade in, on the instrument, on the traded volume, and on several other factors. Current fee size applicable to your account can be found at any time in your Client's area. For example, these are fees applicable to orders of some stocks on AMEX. Approximate (generalized) fees are published on our website; they may, however, vary depending on your personal trading conditions. Standard commissions on all instruments can also be seen in the Demo mode. They always match the ones in Live (real-time) platform mode. The fee for voice trading in case you place phone/email orders is 90 EUR. That fee is charged if the instrument is available in the online platform. If the trading platform is missing an instrument you want to trade, please send a request to our support team. The requested instrument will be added within 1-2 days. Standard EXANTE leverage rate starts from 20% for stocks and 5% for currencies. Short selling is available for liquid stocks with either a predefined limit or utilising a daily locate procedure. Limits and rates depend on the stock, clients' trading strategy and current market conditions. Default rate currently is 12% for easy-to-borrow stocks for all clients, albeit this can change depending on market situation. In order to open position in a hard-to-borrow stock, client needs to contact support@exante.eu for a rate and availability. Generally yes, but it depends on instrument and stock exchange. Please note that liquidity can be very low during these hours and orders can be filled at unattractive prices.